Made from 1.5” Dia. 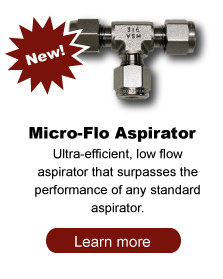 X 6” or 4″ long Teflon, this aspirator was originally manufactured by Lockwood & McLorie, Inc. and developed in cooperation with the DuPont Instrument Products Group in 1965. Because Teflon* and Kel-F** are quite inert, corrosion has not been experienced. The simplicity of the aspirator precludes expensive repairs. * Teflon is a DuPont trademark. ** Kel-F is a 3M Company trademark. 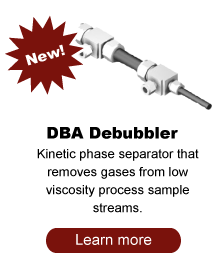 The primary use of the aspirator is to draw gas samples from the atmosphere, from stacks, or from processes to a continuous gas analyzer. In addition, they have been used for pumping or lifting liquid samples, filling reagent tanks and for controlled dilution of liquid streams. 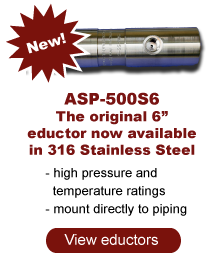 Nearly any fluid can be used as motive power and most fluids can be pumped with these aspirators. However, where the fluid to be moved is gas, gas or air should be used as the motive fluid for greatest efficiency. Where liquids are to be pumped, the motive fluid should be liquid. 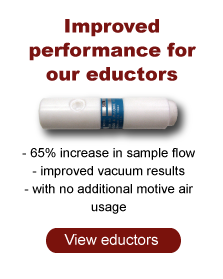 The charts below illustrate the performance characteristics typical of our aspirators. Liquid driven eductors are gaining greater acceptance and application as a reliable method of transporting liquid samples to process analyzers. Whether driven by water or process fluid, designers are realizing their value and increasingly incorporating these ‘pumps’ in sample systems. Read more. or call 423-967-2019 or fill out a Request a Quote form and we will be in touch with you shortly.